This elegant, tufted-back lounge chair will provide homes with the traditional charm of stunning accents in fine upholstered fabrics. The style of this lounge chair combined with its elegant details make it a distinguished addition to casual as well as formal rooms. Complete with richly-finished, exposed wood legs, this tufted back chair may grant your living room the bold, detailed accent that it's been searching for. The 1141 Tufted Back Lounge Chair by Fairfield at Olinde's Furniture in the Baton Rouge and Lafayette, Louisiana area. Product availability may vary. Contact us for the most current availability on this product. Accent sets are used in living rooms to convey bold design elements at affordable price points. This elegant chair and ottoman set makes an artistic accent collection to traditional styled homes as well as semi-casual living spaces. A tufted chair back and elegant spindle legs create a dynamic addition to this two-piece collection while a classic styled ottoman adds modest convenience. A classical addition to your living room collection, this set serenades well in casual to formal styled rooms. 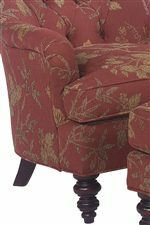 The 1141 collection is a great option if you are looking for Traditional furniture in the Baton Rouge and Lafayette, Louisiana area. Browse other items in the 1141 collection from Olinde's Furniture in the Baton Rouge and Lafayette, Louisiana area.